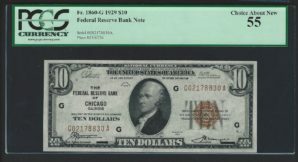 Small Size Federal Reserve Bank Notes or FRBN’s are all dated 1929. Denominations printed were $5, $10, $20, $50 and $100. These notes were hastily produced during the banking crisis of 1933 and were actually printed using National Currency printing plates. Each note therefore states National Currency at the top and carries the distinctive brown seal and serial numbers.